My Tree is Happy Right Where It Is! It makes me feel good. I don’t like Winter. It’s cold and dreary outside. In here, its bright and cheerful. Every morning, I get up and plug it in. It helps me make it through the day, especially when aches and pains are really getting me down. Sometimes, Olive tries to help by removing an ornament or two. She likes to sit on the little table and look at the lights. She also climbs in and pretends that she is a decoration. How could I take it down when she enjoys it so much? I made these for a friend of mine. She’s a mail carrier and wears an old pair that she cut the fingertips off. I just couldn’t stand it anymore so I made her these. 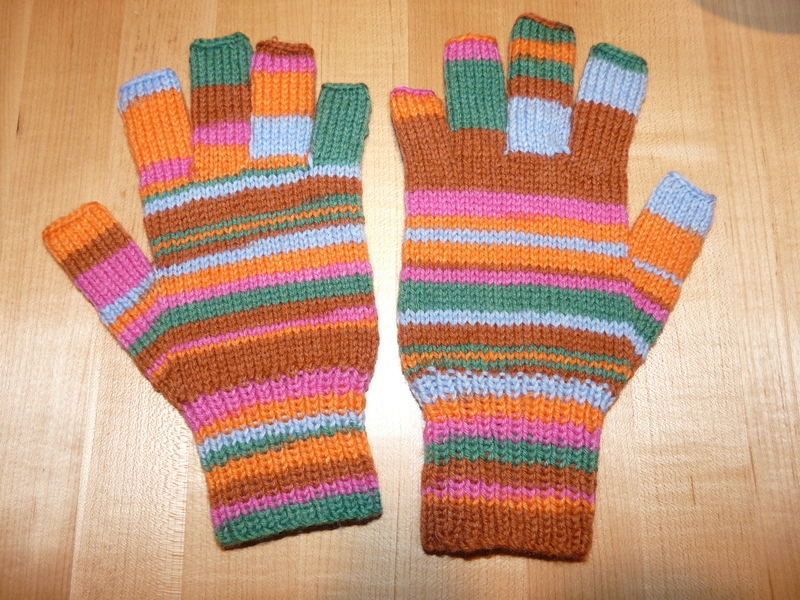 I love to make gloves. They don’t take long and every time I finish a finger, I feel as though I’ve accomplished something. This entry was posted on January 11, 2013 at 10:30 pm and is filed under Family and Friends, Knitting, my pets. You can follow any responses to this entry through the RSS 2.0 feed. Both comments and pings are currently closed. I love this colorway. It sort of screams ‘happy’!